New WordPress update, new WordPress theme, and look…a new blog post! Shortly after the last post, my wife and I began the process of moving from the Pacific Northwest to Middle Georgia so I could start working as an Assistant Professor of Technical Communication in the Mercer University School of Engineering. I’m now halfway into my second semester and having a great time. Lots of things going on and lots to catch up. For now, I’m just blowing the dust off the blog to get back into a more frequent posting rhythm. 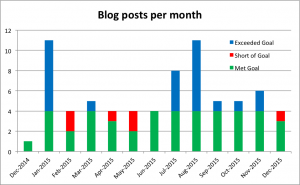 I’ve not done so well with my “four posts/month” blogging goal, lately. I finally pushed out my post on Giving criticism after it sat in my draft folder for the past month and a half. But, I’m back to talk about what I’ve been up to. It’s hard to believe: a) it’s 2016 (and still, no flying cars…), and b) it’s been over three weeks since my last post. I don’t have much to say about flying cars (except that it’s probably better that we don’t have them, yet), but it’s a good time to reflect on my first year of blogging. In my vision statement, I set a few performance goals and the graph shows how I did, last year. Not bad. A few under-performing months, explained (and, perhaps, excused) by the other, higher priority things going on at the time. Finishing my Ph.D. in the first half of the year and, well, I took a break in December. The table shows the statistical summary of my blogging performance for last year. 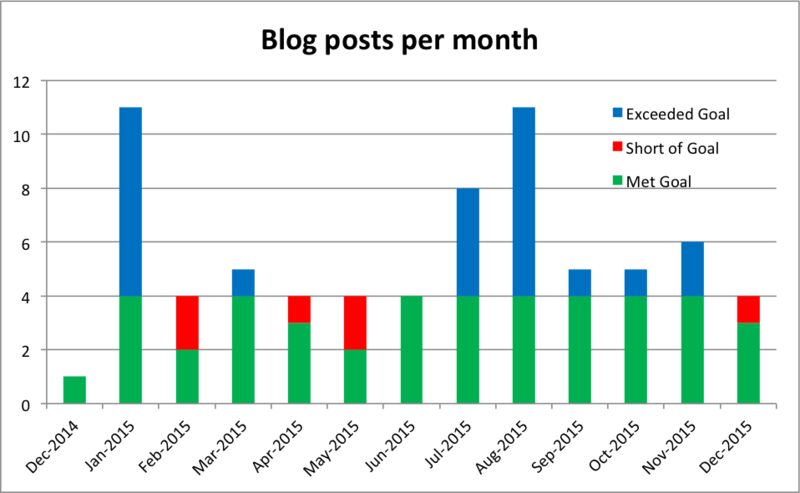 While I had some ups and downs, I averaged more than 5 posts per month. I managed to keep the posts under 500 words, except for the first one of the year–before I set that word count as a goal. Not shown in the stats is the time it took to write each post–about an hour each. I know that because most of them were written as I rode the train to or from the office (usually to) and that ride is 55 minutes. Also not shown in the stats is the “start to finish” ratio, or, what the cutting-room floor looks like. According to WordPress, I started 79 blog posts, last year, and published 66 for a completion ratio of 84%. I don’t know if that’s good or bad–or if published/started is even the right metric. Looking back at some of those unpublished posts, I think the right way to look at that number is that I published 100% of the posts worth publishing. I think, for the time being, I’ll stick with the goals I set last year. The 500 word/post goal was a good goal to enforce sticking to the point and keep the work manageable, but it also limits their value and utility. I’ll be pondering that goal to see about how to create more valuable content while not making the posts to onerous to produce (or read). So, welcome 2016 and all that it will bring and (belated) Happy New Year. I made it to the top-10 most viewed in General Aviation, this week. While, like the most viewed writer in technical writing notice I got a few months ago, this wasn’t an intentional goal, but I think these notices represent what I like to talk and write about. It’s encouraging to know that they are also what people like to read. Quoran is the term for someone who participates in Quora. I’m not sure if you have to submit content or if just reading it qualifies you for the label. Hangar flying is the term for talking about flying, whether you’re doing so in an actual aircraft hangar or not. My projects are rarely as exciting as this so, where’s the story? I was pondering my last reflection, this blog, and my, still imaginary, portfolio and found a recurring theme: they lack is a compelling story. I thought about the elements of a good story arc and words like struggle, challenge, and conflict and resolution came to mind. But, what happens when things go according to plan? A worthy accomplishment, but a boring story. We started our trip in spite of the questionable weather forecast, but we were determined to arrive at our destination in time for my mother’s birthday celebration. The weather turned out to be worse that expected and going over the pass, our car slid into a ditch–reminding me that I should have replaced the worn tires sooner. Unable to get a cell phone signal, we shivered on the side of the road as we waited for a passing motorist to stop and help us out. Finally, a helpful soul gave us a ride to the next town where we were able to get a hot cup of coffee and hire a tow truck. As luck would have it, our good Samaritan was going to the same town as my mother’s party and gave us a lift. We arrived just in time to wish her a happy birthday and share in the cake. I about fell asleep writing the 2nd version. Beyond a beginning, middle, and an end, it had none of the elements of a good story. No conflict. No drama. No tension. I didn’t damage it. It all worked out fine. 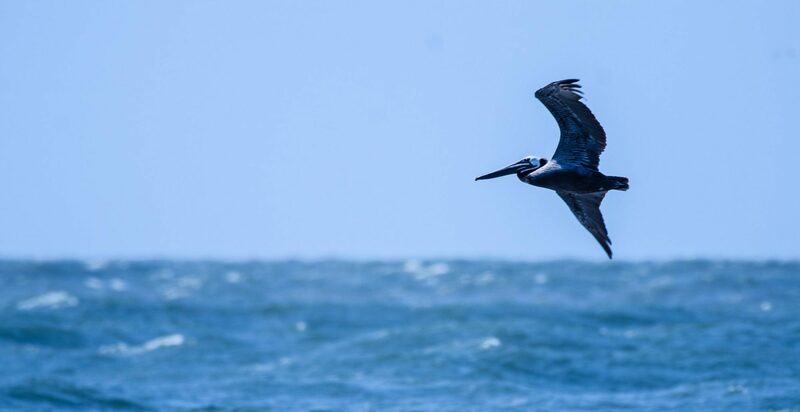 Which leaves me struggling between looking for stories like this flying story I posted in Quora, which have punctuated my life, and describing projects I’ve worked on–most of which are like the second story example above. Maybe that’s the hidden opportunity in all this? Something to work on. It was fun to see this in my Quora feed, this morning. The stats, however, show my fame might be fleeting with #11 nipping at my heels. But, for the time being, I’ll enjoy my moment in the spotlight. Gaining notoriety wasn’t a particular goal of mine, but I might as well enjoy it and it gives me the opportunity to ponder a few things before I dive into the rest of my weekend chores (ponder spelled: p-r-o-c-r-a-s-t-i-n-a-t-e). This is a shame. 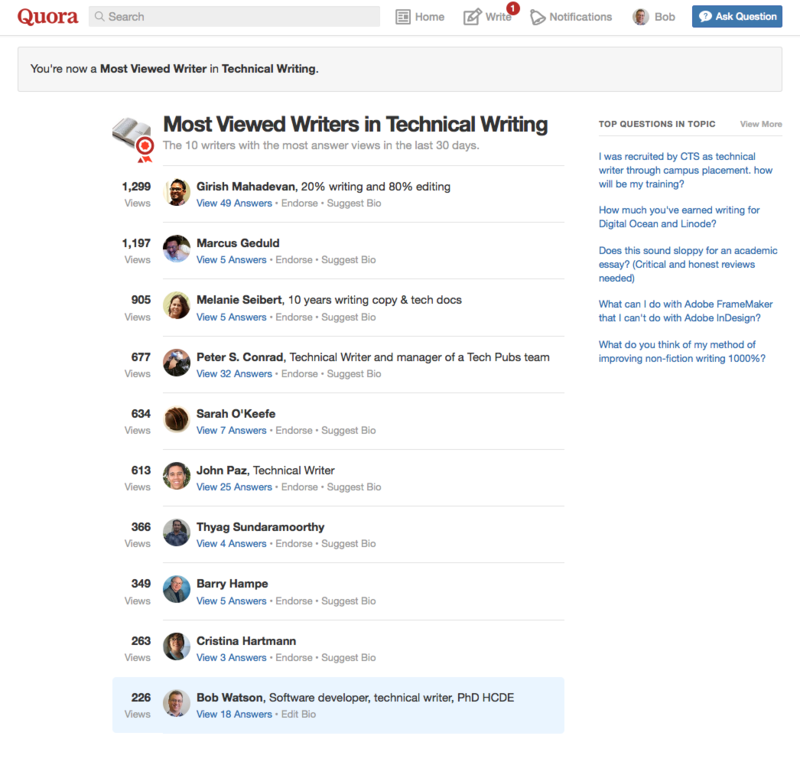 To be more precise, the numbers show that not many technical writers answer Quora in the technical writing topics. It does show that almost 8,000 are following it, but I guess I was expecting it to be more popular, given the high quality of discourse between people in such a broad demographic. Even the topics by the most-viewed writer in Quora’s technical writing topics have had only 1,299 views in the past month. I suppose it could be because there are other forums that narrowcast to technical writers–LinkedIn’s professional writer forums are at least 2-3 times more subscribed, for example. I like Quora for its variety of topics, variety of contributors, and how they all get along. I like Medium, for many of the same reasons. Even as a pastime, I don’t mind answering the occasional technical writing (a.k.a. work) question, but I just don’t see them that often. A quick review shows that I’ve answered 18 technical-writing posts in the past three years. Statistically, I seem to have more fun (or, perhaps, just more to say) about flying and aviation, in which I’ve written as many answers in the past six months. In fact, my most read post is about an in-flight emergency I had while flying with a friend. If it takes an in-flight emergency, or something with that level of drama, to make a popular post, it doesn’t seem fair to compare flying to technical writing. Honestly, flying lends itself to those types of stories much more than technical writing does. In all my professional experience, I can’t recall one life-or-death experience as a technical writer, which isn’t a complaint, by the way. Anyway, check out my posts in Technical Writing—for the content, of course, not just to put some breathing room between #11 and me. I added another goal to my blog vision project, today: to post my online resume and portfolio. It’s a goal that’s been rattling around for a while, but I’ve never actually got around to writing it down. That this goal has been rattling around for so long (maybe 6 years, or more if I’m really honest) illustrates the importance of making things visible. Reflecting on why it took so long to materialize, I came up with the following tips to prevent the next goal from taking so long. Not knowing how to accomplish the goal makes it hard to commit to. Sure, I could have started with something like “have a great portfolio” as a goal (which was where I was 6 or so years ago, by the way); however, at the time, I didn’t have a clear idea about how to make that happen. To commit then would have just been frustrating and defeated the goal of having goals–actually accomplishing something. It could have been an aspiration, perhaps, but it wasn’t ready to be a goal. “Portfolio” was the complicating word, in this case. I couldn’t think of anything that I had for a portfolio. In the intervening years, I’ve talked to people who frequently review portfolios and my definition of portfolio started to evolve. Once I redefined portfolio to mean something more along the lines of an annotated resume, that opened up the possibilities to something I could envision and see a path towards. I had a goal I could commit to writing. Do it if it’s important. Don’t do it if it’s not. While I wanted to have a portfolio (of any kind) since I finished my MS degree (2009), it hasn’t always been the most important thing on the list of things to do. Over the past few years, I would take it from the shelf, review it, and, until recently, put it back on the shelf in deference to something more important or, at least, more urgent. 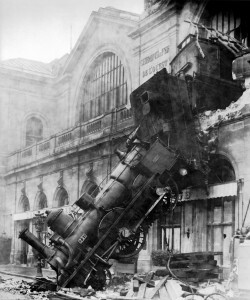 In Agile Development terms, it never made it off the backlog. Yesterday, however, it was well defined and with a clear path to completion, and it was important, so it’s now a goal. Had I made it a goal any earlier, it would have resulted in a lot of wasted effort (non achievable) and likely resulted in more problems (by neglecting what was important at the time). Having a goal without a plan is what happens between the times you decide on a goal and create the plan to accomplish it. During this period, wishful thinking is a good thing, as long as it motivates a plan and the action to accomplish it. Stopping at the wishful-thinking phase, however, won’t get it done. So, it’s on the list and I have a plan. Now, to make it happen! This morning on Fareed Zakaria’s GPS (Fareed Zakaria GPS – Aug 30, 2015), U.S. Army General Stanley McChrystal (Ret.) was interviewed about leadership in the context of Gen. McChrystal’s recent book. His interview starts at [10:36:10], a little over halfway into the program. Zakaria: …[in] the U.S. Army, you give orders, people listen, your job is to appear imposing. McChrystal: …everybody thinks that a sergeant tells you to do something and you immediately do it. … In combat, soldiers are much more frightened of the enemy than they are of the sergeant. So they do things for their leaders and their comrades. …so the ability to influence and persuade and build confidence in you as a leader and in what they’re doing becomes the key task. Zakaria: So, when you looked at…successful examples of leadership, what you found…was a guy who really was able to win the trust of people? That has a nice ring to it. He went on to describe how to accomplish this. Zakaria: Somebody wants to be a leader in their organization, in life. What advice would you give? McChrystal: One, it’s going to take personal discipline… The next thing is empathy. …those core, fundamental, almost value-like traits are the key. It’s nice to hear that empathy is a core, fundamental, trait…even for an Army general. Now, to go and unleash some initiative!